Just got this announcement from ASM for anyone who might be interesting in grant opportunities relating to the microbiology of food safety. 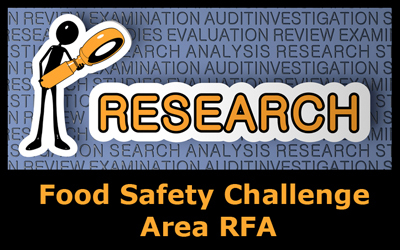 This AFRI Challenge Area promotes and enhances the scientific discipline of food safety, with an overall aim of protecting consumers from microbial and chemical contaminants that may occur during all stages of the food chain, from production to consumption. This requires an understanding of the interdependencies of human, animal, and ecosystem health as it pertains to foodborne pathogens. The long-term outcome for this program is to reduce foodborne illnesses and deaths by improving the safety of the food supply, which will result in reduced impacts on public health and on our economy. In order to achieve this outcome, this program will support single-function Research Projects and multi-function Integrated Research, Education, and/or Extension Projects, and Food and Agricultural Science Enhancement (FASE) Grants that address one of the Program Area Priorities (see Food Safety RFA for details).